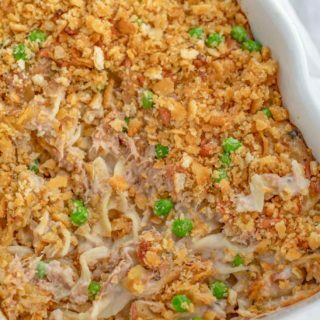 Tuna Noodle Casserole is a CLASSIC dinner made from tuna, peas, onions, and noodles in a creamy sauce topped with a crunchy layer of breadcrumbs and parmesan cheese, ready in under 45 minutes! In a frying pan add the canola oil on medium heat and cook the onion and celery for 2-3 minutes until the onions are translucent. Add the onion mixture to a large bowl with the mushroom soup, evaporated milk, and peas and toss well then carefully mix in the tuna and noodles. Pour into a baking dish then and bake for 20 minutes then in a small bowl mix the cracker crumbs, butter and cheese and sprinkle over the baking dish and bake for 10 more minutes.